We both feel so lucky to be owners of the Dockside Seafood and Grill. We would like to thank our wonderful family that is there to seat a table or answer a phone as well as give up their table for our guests. To our extended family in all our customers, we both appreciate that you let us be a part of your lives to celebrate birthdays, anniversaries, graduations and more. “The Sassy Seafood Sisters” look forward to spending many more years being part of your lives. We have some changes this year to our pavilion area to help accommodate your private parties better. This will also give us the room for some fun events during the summer watch for beer and wine tastings or maybe a painting party. 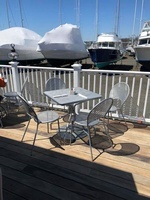 Come and enjoy our deck for fresh seafood, outdoor dining, and the best sunset on the shoreline. So drive on down or sail on in for lunch or dinner daily.